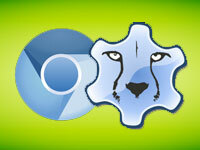 We'll learn how to create a web browser even quicker than you can install one! All using the people's favorite chromium engine! Well, we had a popular post on LazPlanet about creating a web browser using the GeckoPort v1. That was a great way to create a browser and I love Gecko because it is the darling of open source! But it was an old version of Gecko and the newer version does not seem to work. So, today, we have a solution for a browser made with a more updated engine. It will harness the pure goodness of the Chromium Embedded Framework (CEF) and its implementation on Free Pascal, named fpCEF3. Although Chrome has done things that truly-privacy-minded people don't like. But it is a fast web browser engine that is increasingly becoming popular. We all know that Opera ditched its own-coded engine "Presto" and started using "Blink", a variant of the Chromium engine, as their focused engine. Google Chrome also has a good bite in browser market share. Chrome is also running in the Chromebooks pioneered by Google. So, we can say that Chromium has done something right and we're going to learn to build a browser out of that goodness. 2. Extract & Copy the folder to the Components directory inside your Lazarus installation (this is usually C:\Lazarus\Componenets). 5. After the Compiling has completed (the messages window will show a "Success" message), click Use -> Install. Click Yes to rebuild Lazarus. Give it some time to rebuild. Lazarus will restart. Upon restart you'll now see a new "Chromium" tab in the toolbar. 1. Download CEF (version 3.1750) from here or here . 2. Download & Install 7-zip from here. You'll need 7-zip to extract the file above. 3. Now extract the file and keep it that way. We'll only need the "Release" & "Resources" folders from this hotchpotch and jam packed file. Create the browser in 3 minutes! The previous steps were just preparations -- which you'll only have to do once. Now that we're done with those boring setups now we get back in our real business... the browser. Now, in the project directory copy the Resources Folder from CEF package. And then copy all the files inside the Release folder from CEF package, and paste it directly into the project directory. See the screenshot below if you need help understanding (click to enlarge). Voila! Done! Well under 3 minutes! You'll see the LazPlanet website load in your newly made web browser! You can change the code on the TForm1.FormCreate procedure to set another URL as the homepage. Now browse all you want with your new browser! Happy surfing! You can download the above example tutorial project's source code from here. The package contains compiled executable EXE file. Calling different java functions on page and get responses back would be great, there are explanations how to use TWEBBOWSER in Delphi doing this, but for us that prefer to use LAZARUS ... so if anybody knowledgable can make such an example it probably would be interesting for the community. I thinking specially of using this for displaying Google Maps, calling JS function as for instance setting markers and to get user information as mouse moves or mouse clicks on the map. Trying to compile and run the example, it stops on debugger error each time - running lazarus version 1.4.4. Running the already compiled version, everything works OK Both project and compiled application in same folder. What is wrong? Hello. Nice to hear from a reader. For your second question... what does the error message say? "Oops, the debugger entered the error state Save your work now Hit Stop and hope the best, we're pulling the plug. Could not send command to GDB ..." additional info: The GDB command "thread-info" did not return any result. In addition a heap dump is shown indicating error.It is to long to write down, but there are references to line 43 in of frm1.pas and line 18 of proj_simple_cef_browser.lpr in call trace. (used example as given in download). I tried to build a debugger free release, but run into problems - not sure if I was able to shut down the debugger in a proper way. Thank you for the excellent articles! LazPlanet is wonderful. But I'm having a problem with this project -- when I try to compile and run, an Assembler window pops up and I can get no further. Near the top of the window it says "libcef!cef_time_to_timet (614363)". I also tried with a different version of CEF (fpCEF3-3.24.54 and matching 7zip file), but both versions resulted in the assembler window and the cef_time_to_timet message. Any ideas? I'm using a Windows 7 64bit computer but my Lazarus is 32bit so I downloaded the 32bit versions of CEF. I've answered my own question. I found a typo in my code. Oh, I remember this message. It also seem to happen this to me too. But I think it is harmless for release binary. For Lazarus, GDB integration is still quite young. So this kind of messages will probably disappear in the future. Despite this message, the browser release binary seems to work fine without any crashes. Great to hear you solved it! Which version of Lazarus you used for this project? TEditButton has no way of establishing ButtonCaption. I find no way to change the Height and Width of Cromium1 control. It seems it is error of Lazarus. 1. problem does not exist. But many errors appear when I try to install Component (after compiling) . datetimepickerpropedit.pas (72.42) Error: Identifier not found "TComponentEditor"
I need any version with posibility of change Width and Height of Cromium1 control. Great to hear that you found this article useful. If I remember correctly, I used Lazarus 1.2.6 Windows 32 bit. And I did not face any problems similar to you. I will try it again in the 1.4.4 version and let you know. This post really is good, now I am learning Lazarus seriously. I speak now only about the version 1.4.4 of Lazarus. is an example of using Chromium. This example compiles fine, but after F5 appears error. From where get files libcef.dll? 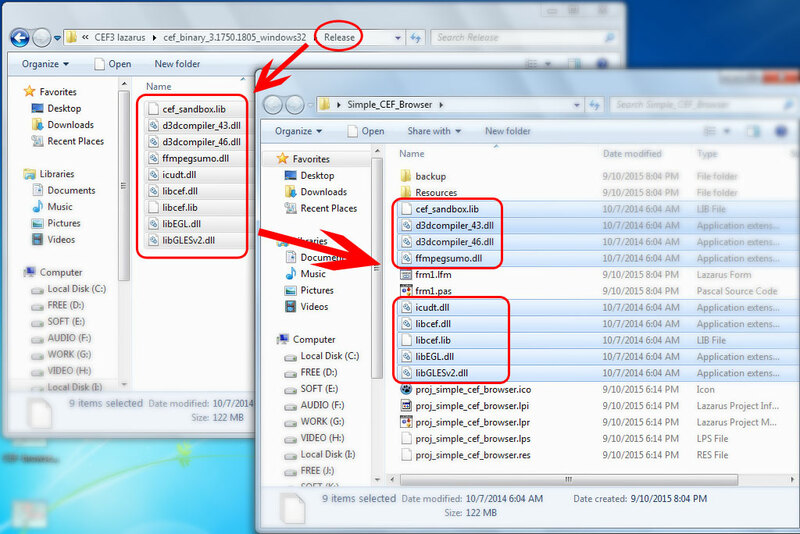 Download CEF3 from here or here and copy all files from either Debug or Release to the folder your .exe is / will be in. After download and decompress appears file libcef.dll.pdb. 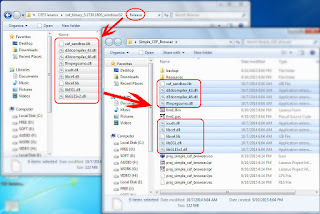 How can be obtain libcef.dll from libcef.dll.pdb? Adnan, do you know this? No, I did not know about this issue. I did not face this problem either. Maybe it is related to the version 1.4.4. I am looking forward to try this tutorial on 1.4.4 myself. Currently I have exams going on. I will try this the next week and let you know. A big thanks for trying it out and pointing out this issue. I am waiting for this tutorial for the version 1.4.4. If I use this method will I need to install chrome browser on target computer ? or is it independent? No, it is standalone. It will not need Chrome browser to be on target machine. fpCEF has all the things needed for your browser. When I try to load url in OnFormCreate event, nothing happen - is it normal ? I've had some of the same issues with trying to use Chromium in Lazarus. It works great if you only have one form (Form1 initialized on startup). However, if you try to create Chromium on a second form called from the first form, things go crazy. I've tried different ways of trying to make this happen, but I get everything from multiple forms spontaneously being created (form1 being initialized again) to Chromium not displaying/showing to memory errors. It's been rough and I think I'm at the point of having to abandon Chromium because I cannot get it to display on Form2 when Form1 creates/shows Form2. btw, to illustrate my issue, here is some code. I can get it to "work" if I do some hacking, but this is not production worthy code. This is just a test application I am playing with to test Chromium. i have follow ur tutorial. but i got the error : Project SRSProject raised exception class external : SIGSEGV at address 7FFFFB3F9A69. I have installed Lazarus version 1.6.4 (Windows 10, 64 bit) and FPCEF3-3.2924. Unsupported CEF library verssion !!!! HELP!!!!!!!!!! That's a quite bad error to have... Did you use the version I shared on the article? Or downloaded yourself the latest one? If unsure which one to use, I would recommend to use the article version first and then trying the latest version. If it still does not work (even with the article version), then I think you can try with 32 bit Lazarus, even if you are on a 64 bit system. It usually solves the library related problems. everytime Lazarus falls to system error OS Code 193..